North Tahoe’s Max Kelly skis to a third-place finish at Heavenly last Wednesday. The high school alpine season is racing toward an end with only a handful of events remaining before the state championships. 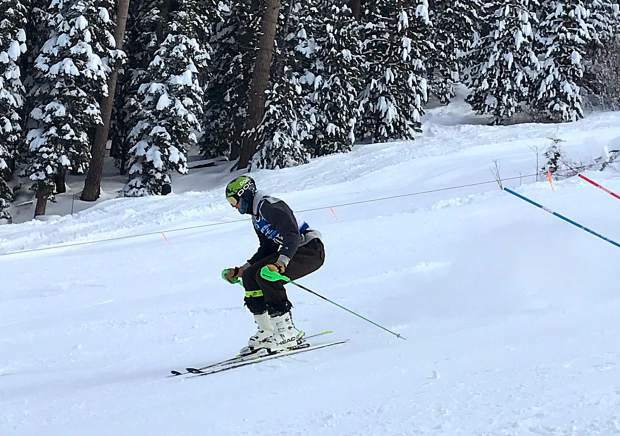 Skiers traveled to Sierra-at-Tahoe Resort last Friday for a round of giant slalom racing, kicking off the first of two events in the span of six days. For the second straight event, Whittell’s Gunnar Barnwell proved to be the fastest on the mountain, racing to the fastest combined time on the boys’ side to take the win. Barnwell’s combined time of 1 minute, 15.26 seconds was more than a second faster than the next fast competitor, South Tahoe’s Luke Allen. Thomas Mercogliano led a trio of Lakers finishing in the top five with a combined time of 1:19.08. Trent Carter (1:21.12) was next, followed by Bodie Hudson (1:22.26) in fifth. The Lakers Murphy Scott (1:27.12) was 11th to give North Tahoe the team win with 206 points. South Tahoe was second with 190 points. Truckee was sixth with 108 points. Drew Dolan led the Wolverines with a time of 1:28.85 for 12th place. In girls’ giant slalom racing, it was all Truckee and North Tahoe as the teams combined for 10 of the 11 fastest times at Sierra-at-Tahoe. North Tahoe’s Maddie Roberts led a Lakers sweep of the podium, finishing with a combined time of 1:17.41. Jillian Ferre (1:18.15) was second, followed by teammate Paige McGarry (1:20.54). From there, Truckee’s Emma Spillman (1:22.45) and a trio of teammates posted the next four fastest times. Whitney Wingard (1:22.46) was fifth, followed by Monique Fellows (1:22.5), and Susie Greeno (1:23.06). Incline’s Brenna Ritchie (1:24.47) broke up the run of North Tahoe and Truckee finishes, taking eighth. Truckee’s Jacqui Roth (1:26.61), Annesly Akers (1:28.14), and Kelly Critz (1:30.36) were ninth through 11th, respectively. North Tahoe’s Elan Lindsey (1:31.29) was 12th to give the Lakers the team win with 210 points. The Truckee girls were second with 206 points. North Tahoe’s Roberts picked up a second straight win as racing continued last Wednesday at Heavenly Mountain Resort with slalom. Roberts led the Lady Lakers to the overall win, finishing with a combined time of 50.7 seconds. Teammate Aliza Neu (51.60) was second, followed by Truckee’s Greeno (54.84) in third. The Lakers’ Reilly Scott (56.46) was fourth, followed by teammate Ella Carr ( 57.32) in fifth to give the team 216 points. The Lakers also had Olivia Sproehnle (1:00.60) take seventh and Lindsey (1:04.40) finish in 10th. Truckee also had Roth (1:02.00) crack the top 10, finishing in eighth. On the boys’ side, South Tahoe’s Allen took first place with a combined time of 46.09. Whittell’s Barnwell was second with a combined time of 46.19, followed by North Tahoe’s Max Kelly in third with a combined time of 46.57. From there, Lakers skiers took over, posting the next four fastest times. Guthrie Goss (46.71) was fourth, followed by Carter (47.66), Mercogliano (48.57), and Scott (50.10). The North Tahoe boys took the overall win with 210 points, topping second place South Tahoe, who finished with 191 points. The Truckee boys had two skiers on the course. Nick Rae led the way for the Wolverines with a time of 1:05.30 for 23rd. Racing will continue next Tuesday at Alpine Meadows with a round of giant slalom.